I have been trying to click the attached highlighted (in red arrow) icon from IOS using Appium but keep getting timeout exception. This click is required against only the record of ‘193930 Copy 1’ in a table. Any assistance? Can you share Appium logs ? Also, xPath is slow, So why don’t you try iOS predicate for finding more button . And can you also try to find this more button in Appium Desktop through search for element functionality. 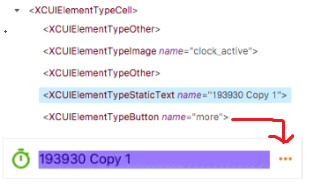 Check if the visible tag is showing as True in the Appium inspector for the button which you are trying to access.